Blepharoplasty basically is surgery in which excess tissue is removed from the eyelids. It is the most commonly performed cosmetic surgery of the face. Upper eyelid surgery is usually performed for removal of excess skin, muscle and fat and lower lid surgery for the removal of fat pads, so called baggy eyelids caused by herniation of periorbital fat. The most serious complication of blepharoplasty is partial or complete loss of vision, most commonly as a result of intra-orbital hemorrhage. A widely accepted theory suggests orbital bleeding increases intraorbital and intraocular pressure, compromises the ocular circulation, and results in ischemic or optic nerve damage. Ischemic optic neuropathy and central artery occulsion are believed to be the most common final events in most cases of blindness after blepharoplasty. (Lowry JC, Bartley GB: Complications of Blepharoplasty. Surv. Ophthalmol 38:327-350, 1994). Acute orbital hemorrhage constitutes a medical and surgical emergency. Severe permanent visual impairment is likely if vascular compromise exists for more than 90 minutes. Prompt recognition and management are essential. (Id. at 332). Blepharoplasty is a procedure performed not only by plastic surgeons but by ophthalmologists, dermatologists and otolaryngologists. Further cosmetic surgery is an area of medicine that is highly advertised and competitive. The patient has a right to know not only the risks of the procedure but the training and experience of the physician. In addition to the article cited above, excellent discussions of Blepharoplasty are: Castanares MS, Complications in Blepharoplasty. Clinics in Plastic Surgery, Vol. 5 No. 1 1978; ALT TH, Blepharoplasty. Dermatol Clin, Vol. 13 No. 2 1995. 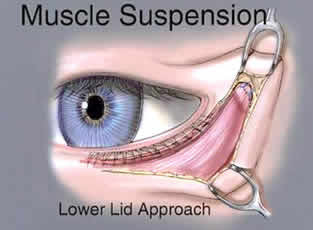 Lyon DB, Raphtis CS, Management of Complications of Blepharoplasty Int Ophtalmol Clin Vol. 37 No. 3 1997.